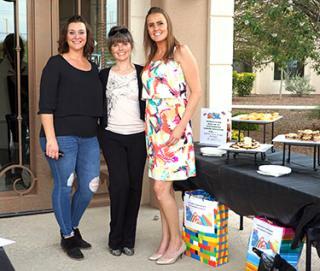 From left, Tonya Henry of Henry’s BBQ, Kasandra Geeslin, property manager of Canyonstone Apartments, and Shannon Butts, Canyonstone leasing specialist, teamed up prior to the start of the 2018-19 school year to collect supplies for teachers in the Artesia Public Schools system. The supplies will aid teachers who often find themselves purchasing items out-of-pocket in order to provide things students might need over the course of the year. Anyone still wishing to donate supplies may do so at any time by contacting Henry at Henry’s BBQ or Geeslin at Canyonstone.